Cleavers, dandelion, fenugreek seed, garlic, goldenrod, nettles, sage and seaweed. It is supplied with a small spoon-sized scoop. 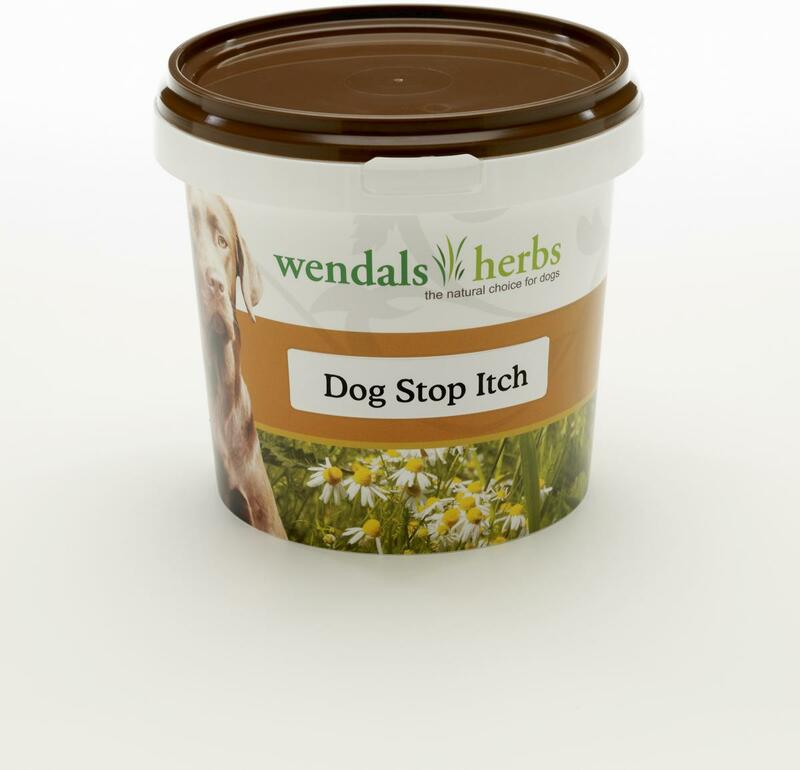 Below are some recent questions we've received regarding Wendals Dog Stop Itch for Dogs, including answers from our team. Hi. I see that an ingredient of this is garlic. I thought dogs shouldn't have garlic. Can you clarify please. Thanks. Garlic in excess can be harmful to dogs however small amounts are not harmful and are in fact thought to have health benefits. What is the percentage of this ingredients , such are cleavers, dandelion, fenugreek seed, garlic, goldenrod, nettles, sage and seaweed? This is a proprietary product and this breakdown is not provided by the manufacturing company. We do not have this information. The ingredients are cleavers, dandelion, fenugreek seed, garlic, goldenrod, nettles, sage and seaweed for this product. Why the dog can eat Garlic? It is sometimes stated that garlic is poisonous to dogs, but that is a a hugely misleading statement. It is a bit like saying that vitamin D is poisonous. The facts are that if you give ridiculously large amounts of either garlic or vitamin D, they are toxic and can produce a variety of adverse effects. However when given in normal, sensible amounts.they can be extremely beneficial (indeed dogs and people would probably die if they received no vitamin D at all). The vital part of the discussion is the amount which is given. For garlic to be toxic to dogs, a large amount has to be given. (Up to 1 clove per 10kg bodyweight is often advised as beneficial and way below the amount needed to cause toxicity. The only scientific study into garlic toxicity in dogs which I know of used concentrated garlic extract to give to 4 dogs. Apparently they showed adverse reactions which could be measured in their blood, but they looked and behaved perfectly well otherwise. The amount of garlic they are given was many times greater than anyone would normally give as a supplement. The other point I would make is that there have been huge numbers of garlic-containing herbal remedies given to dogs for many years. They are given on the basis that it is widely believed that garlic has lots of beneficial effects in the body (though these have mostly not been scientifically proven either). Basically the point to take from this is that garlic has been shown to be perfectly safe and perhaps beneficial if given in moderate amounts. It would be poisonous if given in large amounts for a long time, but herbal products such as this one contain very safe quantities and you have no need to worry at all. "Moderation in all things" is the appropriate advice. What ingredients are in this , my dog only has natural organic products, she is raw fed and has coconut oil in her meals daily plus herbal mix , I don't believe in giving her poisonous flea treatments or any chemicals , however she does seem to have an allergic reaction to a flea bite at the minute she's been targeting her belly area , she's had a bath and had coconut oil rubbed into her coat just wondered what other things are out ? The ingredients are cleavers, dandelion, fenugreek seed, garlic, goldenrod, nettles, sage and seaweed. How much and how often do you have to feed this supplement?